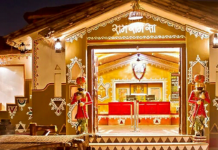 A Rajasthani sweet, Ghevar is traditionally linked with Teej Festival which comes during the monsoon season. Teej represents the union of Goddess Parvati & Lord Shiva. 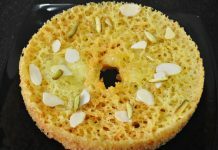 Ghevar is normally made in January for Makar Sankranti festival, in March-April for Gangaur festival and in July-August for the festival of Teej. This dessert has its origins in the city of Jaipur, capital of Rajasthan. A honeycomb shaped delicacy made using plain flour and ghee that has originated in Rajasthan. Ghevars are usually large in size approx. 200 mm. or 250 mm. (8″ or 10″) squares or rounds and are either sweetened with syrup or served topped with sweet rabdi. Mix together the flour, corn flour, Yell and melted ghee in a bowl. Add one cup of water in a thin stream and whisk continuously so that all the ingredients blend well, and the ghee and water emulsify into a smooth mixture and do not separate. Keep the batter in a cool place away from heat, but not in a refrigerator. In a non-stick pan, cook the sugar with half a cup of water, stirring till the sugar dissolves. Add the milk. Collect the scum which rises to the surface with a ladle and discard. Cook till the syrup attains a one-string consistency. Stir in the screw pine essence. Remove from heat and keep warm. Pour three ladlefuls of the batter into a small bowl, add a pinch of soda bicarbonate and mix well. When the centre is firm and cooked, gently pull out the ghevar from the mould with a wooden skewer inserted in the centre. Hold it over the kadai till most of the ghee drains away. Immerse in the sugar syrup for twenty minutes. Drain and place on a platter. Decorate with the silver foil, rabdi and almonds. Cool and serve.